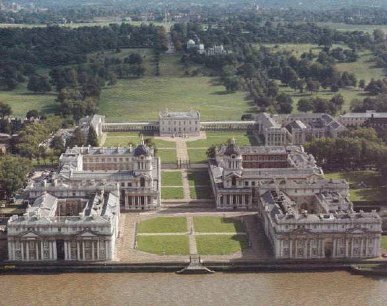 Greenwich was the playground of English kings and queens. Henry VIII and his daughters Mary I and Elizabeth I were born here, and Greenwich Palace was Henry's favourite residence. He could hunt in Greenwich Park and visit his beloved home fleet, the wood wall of England, at anchor along the river. It was at Greenwich that Sir Walter Ralegh put his cloak over a puddle so Elizabeth I wouldn't get her feet wet. 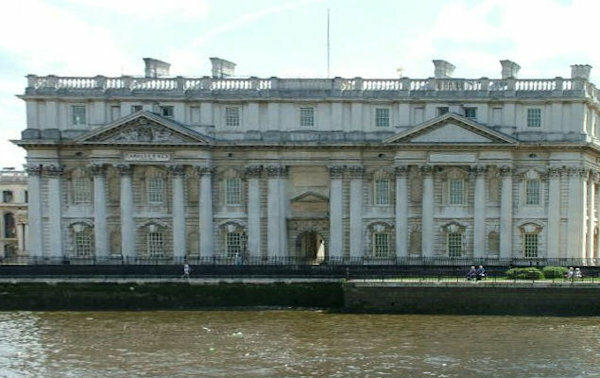 The great Baroque masterpiece of British architecture is the Old Royal Naval College set on the south bank of the River Thames at Greenwich. Looking at the top photograph of these magnificent buildings, it seems a bit churlish to mention that they have not been finished. The two wings that make up the river frontage, both have the architectural detail of a series of columns. As can be seen in the top photograph, the columns of each wing are arranged into two sets of eight columns, with the four centre columns of each set supporting the normal classical triangular pediment (the long flat triangular part immediately above the centre four columns). The original design called for the pediments to be carved with classically alorgorical themes. Only one was ever completed, the second from the right in the top photograph and shown in more detail in the lower photograph. The others pediments will probably remain unfinished for all time as now we have an understanding that the incompleteness is historical in itself (and certainly the "experts" would never be able to agree what form any new carving should take, and while on the subject of reasoning, the high-quality stone carving skills necessary to complete the work are still available). Text based on information at the Timeout site.